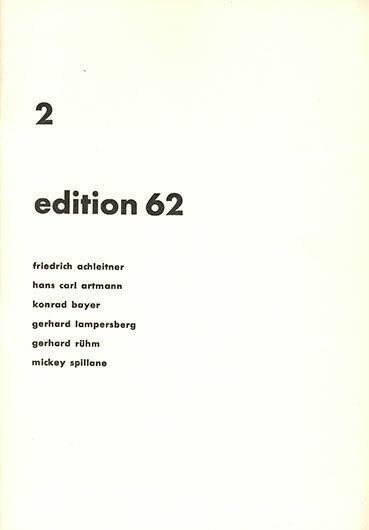 Second and last volume of the „Edition 62“ booklets published & curated by Konrad Bayer and Gerhard Lampersberg in 1962 and 1963. 40 pages, 16,5 x 23,5 cm, german. With contributions by Gerhard Rühm, Konrad Bayer, Friedrich Achtleitner, Hand Carl Artmann, Gerhard Lampersberg, Mickey Spillane.